Hitting Walls Slows Down the Car! NOT IN A GOOD WAY! Wall hits not only slow down the car but they stall acceleration for a considerable length of time. Some turns require a lot of slowing down to avoid hitting the walls, use the brake to help slow the car down sooner. Some turns are just a slight radius outside your car's turning ability at a certain speed, slow down a little by just ungassing. Practice playing and this will become clear. The basic concept of racing is going fast, right? Well its all about balance. 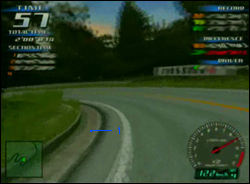 At first it is common to think that the fastest way to enter a turn means that you are going faster. However this is not the case, there are a few factors in which one should consider. Firstly if one practices "late braking" they are indeed enter a turn at high speed, but the consequence would be that during the turn they'll need to slow down more to clear it. If however, one chose to brake/slow down sooner the turn could be cleared sooner and allow for earlier acceleration yielding higher exit speed. The way to maximize a turn in this sense is to mizimize the distance traveled and make it less of a turn than it really is. Figure b1 illustrates how this is achieved. The correct line, Blue: First, start at the furthest outside of a turn then turn as close to the inside as possible. Braking should be done while on the outside before turning. During the turn ungas until roughly around the apex. This basic line is called out-in-out. While accelerating, the car will begin to move towards the outside of the exit. 4) Outside (can check exit speed here), counter steer if needed. *NOTE: When the gas is depressed at the apex, the car will not be able to turn as much and because of this it will begin to go outside. Practice yields the best gassing point in which you have almost no room on the outside yet not hitting wall too. Not All the Turns are the Same! With practice, one will begin to see that each turn has its own unique depth. Some will require only a full turn while others have more depth. Most turns are executed successfully by turning a little bit then all the way. Practice a few times and you will definately begin to see how each turn is different and how it should be approached. Although it sounds like an advanced technique, Machine Gun Shifting is nothing special and most new players will do this without thinking twice. Machine Gun Shifting, or MGS, is simply shifting down 2 or more gears to help slow the car down faster. These are just examples of places where MGS is most commonly and effectively used. If you find that MGS can help you clear a turn faster than normal, and if it means that you don't hit a wall, use it. The only course with useable gutters in versions 2 and 3 of Initial D Arcade are on Akina. Version 1 had gutters on all courses, however except akina, they were invisible. Using the gutter is a basic concept in the game. If one recalls the out-in-out, acceleration can be achieved sooner if one takes this line. By using the gutter, acceleration can be achieved even sooner! This is because a gutter helps pull the car inside a little more, making sooner acceleration possible without hitting the outside wall. To use a gutter, simply slip the front tire into it during the apex of a turn. Becareful using a gutter because gutters are along the sides of the course, it is possible to hit the gutter side wall causing a wall hit. Note Figure b2, the blue 1 shows that on the left side of this hairpin, there is a gutter. You should be able to feel and hear a *clink* sound if you enter the gutter.